A few posts ago I told you that I had finished a more involved painting that was a custom order. 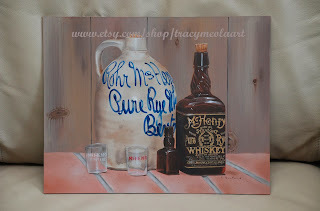 The painting was for a collector, that collects McHenry's Whiskey products. McHenry's was a distillery that began in 1812 in Benton PA. In 1911 the distillery had a fire and basically struggled to catch back up financially, after rebuilding. 17,000 barrels of maturing whiskey were destroyed in the fire. The bi-products of the distillery (bottles, jugs, labels, shot glasses, trays, etc) are desirable by collectors.